Dan Lyons was Technology Editor at Newsweek Magazine for years, a magazine writer at the top of his profession. One Friday morning he received a phone call: his job no longer existed. Fifty years old and with a wife and two young kids, Dan was unemployed and facing financial oblivion. Then an idea hit. Dan had long reported on Silicon Valley and the tech explosion. Why not join it? HubSpot, a Boston start-up, was flush with $100 million in venture capital. They offered Dan a pile of stock options for the nebulous role of "marketing fellow." What could possibly go wrong? What follows is a hilarious and excoriating account of Dan's time at the start-up and a revealing window onto the dysfunctional culture that prevails in a world flush with cash and devoid of experience. 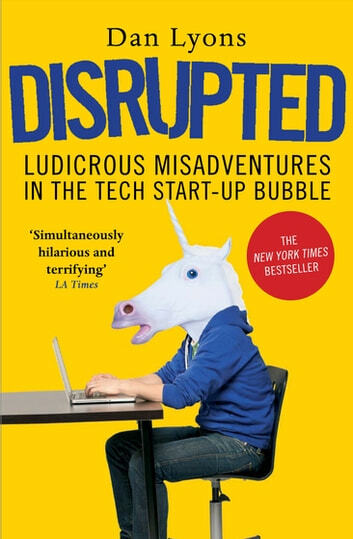 Filled with stories of meaningless jargon, teddy bears at meetings, push-up competitions and all-night parties, this uproarious tale is also a trenchant analysis of the dysfunctional start-up world, a de facto conspiracy between those who start companies and those who fund them. It is a world where bad ideas are rewarded with hefty investments, where companies blow money lavishing perks on their post-collegiate workforces, and where everybody is trying to hang on just long enough to cash out with a fortune. Really fun read of the ugly side of highly funded tech Startup world. Dan's writing is easy to read and flows well. Slight sadness as nothing has changed since The book was written.